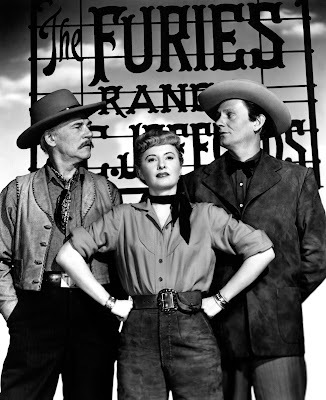 Today I'm reviewing the classic Western The Furies (1950) starring Walter Huston (left), Barbara Stanwyck, and Wendell Corey. 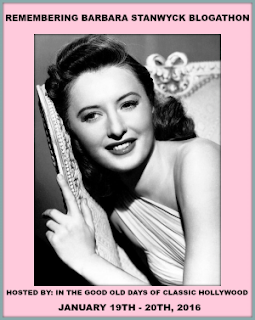 This article is part of the Remembering Barbara Stanwyck blogathon hosted by In the Good Old Days of Classic Hollywood. Barbara Stanwyck is the undisputed queen of old Hollywood Westerns, and The Furies (1950) is one of her best films of that genre. This psychological Western directed by Anthony Mann features Stanwyck as a strong independent woman who can ride, shoot, and run a ranch better than most men. The Furies centers around Vance Jeffords (Stanwyck), the only daughter of powerful New Mexico cattle rancher T.C. Jeffords (Walter Huston). Even though T.C. has a son (John Bromfield), he plans on leaving his entire empire to the much more capable Vance, provided she can marry a man that he likes. This task is harder than it seems because Vance is torn between her childhood sweetheart (Gilbert Roland), who is considered unacceptable because he is Hispanic and is squatting on the Jeffords' land, and a ne'er do well gambler (Wendell Corey) whom her father intensely dislikes. A French poster for The Furies (1950). 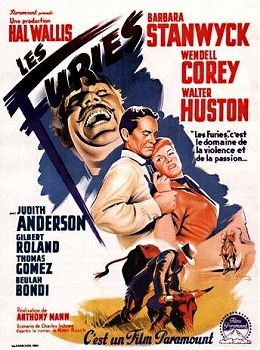 The Furies is based on a 1948 novel by Niven Busch, who wrote several popular potboilers in the 1940's, including Duel in the Sun, which was turned into a successful 1946 movie starring Jennifer Jones and Gregory Peck. Duel in the Sun's overheated melodrama garnered harsh condemnation from religious groups and earned it the derisive nickname, "lust in the dust," but , not surprisingly, it still earned a bundle at the box office (One of my favorite parts of Martin Scorsese's documentary, A Personal Journey Through American Movies, is his memories about Duel in the Sun. During his childhood, it was the hottest ticket in his New York City neighborhood mostly because it was condemned by the Catholic Legion of Decency). While The Furies is nowhere near as risque as Duel in the Sun, it very much falls into the same psychological Western pattern as the earlier film. In fact, the movie's title reflects its roots in Greek mythology: The Furies were the goddesses of revenge in the ancient Greek religion, and this film plays out very much like a tragedy by ancient writers like Aeschylus and Euripides, who used character archetypes and heightened emotion to propel their tales of remorseless fate. A lobby card for The Furies (1950). The focus on elemental emotions in The Furies is a deliberate choice by Mann. This movie is one of the first Westerns he made after switching to that genre from film noir, and The Furies really establishes the style he would cultivate in his series of films with James Stewart. Mann uses the Western backdrop unlike any other director before or since; John Ford in The Searchers (1956) comes the closest to replicating his style. For Mann, the stark desert landscape brings out the ruptures in the human psyche, and exposes our deepest emotions. In some of the Mann-Stewart collaborations like The Naked Spur (1953) and Bend in the River (1952), Stewart defies his aw-shucks screen persona to become characters who are cold, ruthless, and even prone to hysterics. In my opinion, Mann's style is both the best part of The Furies, and the film's downfall. Stanwyck, Huston and the great classical actress Judith Anderson -- she plays a money-hungry widow who becomes Huston's love interest -- are more than up to the challenge, but the other actors, especially Corey, who is badly miscast as a Rhett Butler-type, fall under the weight of the over-the-top emotional baggage. 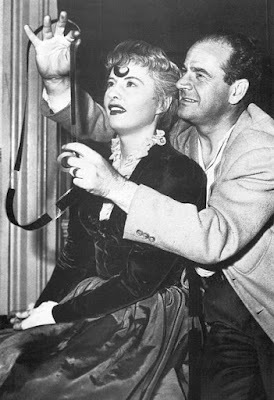 Barbara Stanwyck and Anthony Mann. Nevertheless, The Furies has some wonderful scenes (I would not classify it as a great movie; instead, it as a good movie with some great moments). An Oedipus Rex-like maiming scene and a tension-filled lynching scene are triumphs for the actors and feature some great cinematography from Mann and director of photography Victor Milner. In fact, the best part of The Furies is Stanwyck. There isn't a single actress in Hollywood -- then or now -- who could have played Vance so well. Stanwyck was an excellent horsewoman, and it show in her many riding scenes, but she brings something more to the character than athletic skill. There's a common myth that old Hollywood movies only feature damsels in distress, when, in fact, they were filled by strong characters played by the likes of Bette Davis and Joan Crawford. Even by those standards, Vance is exceptional. Stanwyck plays her as a strong independent woman, who is much more capable than her father in running the ranch, and she refuses to bend to the will of her father or any other man when it comes to making decisions about The Furies. 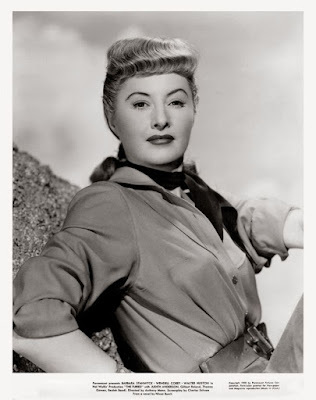 Stanwyck's great performance in The Furies led directly to her later roles in Westerns like Cattle Queen of Montana (1954) and on the TV show, The Big Valley. The Furies is available on DVD from the Criterion Collection. Go here for articles from my past blogathons. You nailed "The Furies" as a good movie with great moments, but those moments are certainly worth the price of admission. Absolutely. Walter Huston is worth the price of admission alone. He's just an amazing performer. Even taking your warning that this isn't a great movie, I'd still really like to see it. Enjoyed your thoughts on Stanwyck's Western roles. I love Stanwyck's Westerns. I even love her TV show, The Big Valley.